This page describes how to use keys in the TopDown Engine to unlock doors, open chests, get loot from them, and interact with stuff in general. Thanks to the Inventory Engine, the TopDown Engine natively supports the creation, collection and use of keys. Keys are inventory items that, combined with a few components on your scene elements, will allow you to interact with doors, open chests, loot their contents, and generally activate stuff in your scenes. 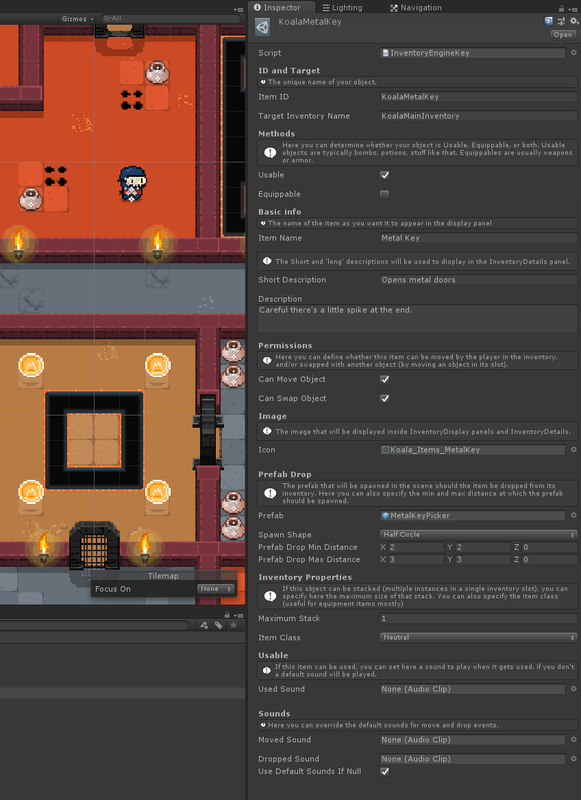 If you want examples in action, you can check (among others) the MinimalSandbox2D demo scene, located in Demos/Minimal2D, or the KoalaDungeon scene, they’ll provide working examples of key activated doors and chests. If you’re familiar with the Inventory Engine, this will be easy. If not, you should probably check out its documentation. To create a key, simply right click in one of your Resources folder, then go Create > More Mountains > TopDown Engine > InventoryEngineKey. Give this newly created scriptable object instance a name, and you’re ready to fill its details in its inspector. One of the most common things you can open with a key is a door. So let’s start with that. 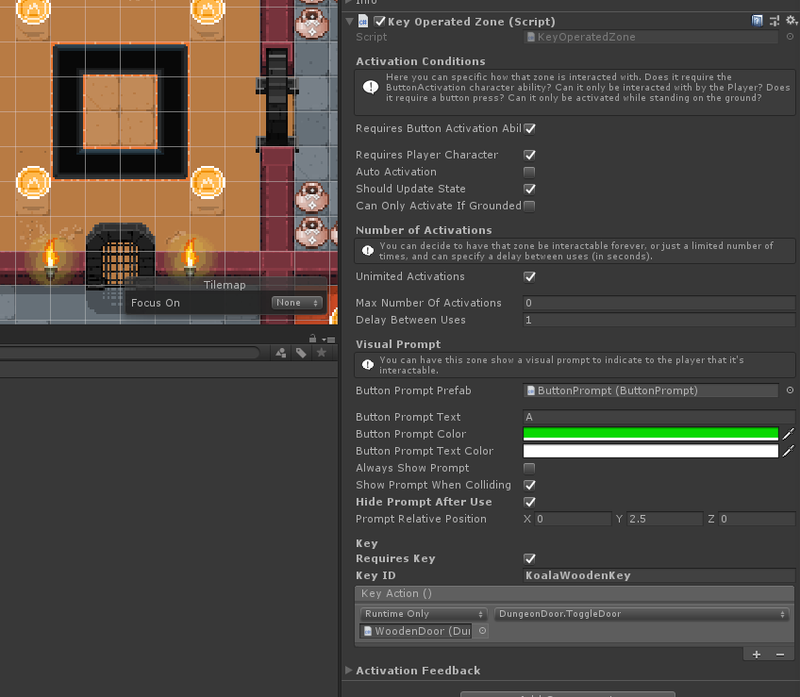 The most simple way to create an openable door in the TopDown Engine is to reuse either the 2D or 3D door prefabs. It could also be a moving platform, or a wall, or anything you want. The only mandatory element will be a Key Operated Zone component. The last thing to do is to bind an action to this zone. This action is a method on any object in your scene that will be triggered when the zone is activated (when you enter it and have met the conditions you just defined to activate it : button pressed, key in inventory, etc). In the case of the 2D door, you’d have to drag the DungeonDoor component into our action field, and select its ToggleDoor method. Creating a chest is just as simple as creating a door. Create a Key Operated Zone just like before, and then drop a sprite or 3D model into your scene for your chest. On that chest object, add an InventoryEngineChest component. Then all you have to do is add ItemPicker components to it (one per item you want in your chest). Then bind your Chest to your KeyOperatedZone’s inspector just like before, using the InventoryEngineChest.OpenChest method this time. You’re done! When activated, the InventoryEngineChest component will automatically pick all the ItemPickers you’ve added to it and put their items into your character’s inventory. Additionnally, you can add an animator to it to trigger an open animation. Your animator will then need a trigger Animation Parameter called “OpenChest”. You can find a working Chest example in the KoalaDungeon demo scene.